It sounds like a hippie-chic mash-up concocted by a pair of flower children on a commune, the logical choice for Moonglow and Whiteriver’s new sibling. But in fact, it’s a valid surname and given name with a history that stretches nearly a thousand years. Thanks to Katharine for suggesting today’s Name of the Day: the intriguing Loveday. While Loveday has never charted in the US Top 1000, early census records confirm that at least a handful of women bore the name in the 19th century. We also find mentions of Lovedays in the UK, Canada and Australia during the same era. Today, the name is far more common as a surname. It’s even possible that some of those Lovedays from the late 1800s and early 1900s are wearing a family name in the first spot. Either way, Loveday’s origins are probably the old English leofdaeg or lieftag, which translates more closely to “dear day.” Other theories suggest that it is a translation of the Latin dies amoris. The first seems slightly more credible – and widespread – an explanation. A loveday was an established medieval tradition calling for certain days to be observed as times to amicably resolve disputes. Just as some children born on Easter have worn their birthday as a given name, the same appears to be true of Loveday, for both boys and girls. It’s difficult to pinpoint when the name entered use. The practice of holding lovedays is referenced in 13th century historical documents, but the name appears to predate the event. Some sources claim it is used as early as the 7th century, but we’re unable to confirm an earlier date. By the early 1200s, other terms based on the word leof were in use, including the archaic leman, or sweetheart, so we’re comfortable assuming that Loveday has been with us for nine centuries. We’re hesitant to believe any reports of how common the name might’ve been, but we’re certain that it was heard periodically well into the 1800s. Some five or six years previously, by a jerk of Fortune’s wheel, Loveday had been thrown upon the world penniless and all but friendless. Marketable accomplishments she had found she had none, so she had forthwith defied convention, and had chosen for herself a career that had cut her off sharply from her former associates and her position in society. It’s easy to love the idea of Loveday, and even some of the daffier elaborations and respellings that are either modern adaptations or unusual variants preserved from earlier times: Lovedaya, Lovedaia and Lovedie all pop up on searches. As with our lady detective, we’d expect a girl called Loveday to be a bit of an independent thinker and unusual character. But since personality is difficult to predict when you hold your newborn daughter, we think this is one best reserved for the middle spot. 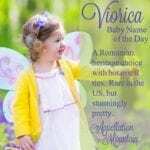 Few will recognize the name as an authentic medieval moniker, and instead your child will probably be known as Lovey – a nickname that feels insubstantial and flighty, not unlike the Gilligan’s Island character Mrs. Eunice “Lovey” Howell. What’s more, in recent years the jeweler Cartier has launched an annual Loveday celebration. The celeb-studded events include the unveiling of signature pieces of jewelry with sales to benefit charity. While we admire the public relations team who landed on the concept, all that bling has a way of tarnishing the medieval allure of the name. It’s sort of like Mercedes – no one believes you’ve chosen an elegant Spanish appellation that refers to Saint Mary; everyone is positive your daughter is named after your car fetish. So while Loveday isn’t as widely recognized as Armani or Chanel, there’s danger that your child’s name could be mistaken for a luxury brand. In all, we find Loveday as intriguing and mysterious and, yes, strong, as on our first impression. But it’s a tough name to pull off, and we think we’d rather meet a Cordelia Loveday or a Tallulah Loveday than a Loveday Jane. Hey to all Loveday lover’s. This is my last name from a former marriage and I love it. The name is not very common where I live in the state of South Carolina, majority of population lives in TN. I receive compliments on my name every where I go and since it’s uncommon, when people hear my name they automatically say oh I know your son. Our own little Royal Name…. I grew up with a girl whose middle name was Loveday. I was very envious! I happened to read that thing about Mercedes.. my full name is mercedes, oh my goodness. Yes. UGH its terrible. Actually, I love Mercedes! I just hate the idea that everyone thinks you’re named after a luxury car. Kind of like Portia – gorgeous name, but it has a whiff of motor oil about it. Too bad. You’ve got it! Clara will be August 22. It’s actually a family name in a big way on my mother’s side – actually, Chiara, the Italian version of the name. Since there’s a tradition to name children after their grandparents, and my family tried to distinguish between the many namesakes, I have aunts and cousins (and a mother) named Claire, Clara, Clarice, Clarina … and on and on. And on. I’ll be happy to delve into Clara. I’m surprised there aren’t more out there. Yes, Verity, please do Clara! (How about as a birthday present to me — August 22?) I know it’s not as rare as some of your other choices, but it deserves more recognition than it’s getting, especially with choices like Emma, Hannah, Anna, Mia, and Sarah all in the top 20 or 30. My husband and I are hoping to name our first daughter Clara Anneliese (we chose the middle name since it’s a combination of our mothers’ middle names, Ann and Elizabeth). Verity – you mentioned Clara. I love this name, especially with the uprise of Claire – somehow Clara has more weight. Would you like to give Clara a NotD spot? I’m not sure I really did her justice, though. I’m very new to names from the early Middle Ages, and need to read more. I’m fascinated by the many, many given names that have all but disappeared in the 21st century. Kayt, I’m putting Aurelia on the calendar for August 17 and Isla down for August 19. I think Isla is going to be BIG, but I love her anyhow. 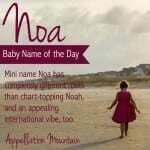 And Lola, you officially come from a long line of the World’s Best Baby Namers. When I look back at my tree with the repetition of the same few dozen names – Vincent, Anthony, Arthur, John, Rose, Clara, Sara on one side and John, Mary, Anna on the other – I am terribly, terribly jealous! I’m glad people didn’t think I had lost it suggesting this one! But, I have come across it a few times and was always intrigued to learn more… As for Edith Isobel Loveday – gorgeous! I was going to say exactly the same as you all seem to have already agreed that Loveday feels more useable as a middle name – surprising and enchanting and a lot more interesting than the usual filler middle names any day!! Lola, I love Edith Isobel Loveday! I have a huge soft spot for Isobel in the middle, as my grandmother was Margaret Isobella. We’re using Margaret for a middle name to honor her and my sister, but I would love to use Isobel as a middle name! I have to admit, I dismissed Loveday as a hippy name or a Muffy/Mitzi/Fifi kind of name. I love it as a middle name with a more serious, older fashioned first name. Thank you! 😀 That’s where Loveday feels most comfortable for me, in the middle, at the end! Oooh … Edith Isobel Loveday – that’s gorgeous!